My surprisingly delicious matcha bagel had tiny white chocolate chips. The other day at the commissary Brett and I bought a loaf of American-made seven-grain bread. I used some for sandwiches the day before yesterday, and the first comment from both of us was, “Wow – the bread is so sweet!” This was our favorite kind of bread back in the States, and we never noticed it before, but after two months here we have become accustomed to things being a lot less sweet. 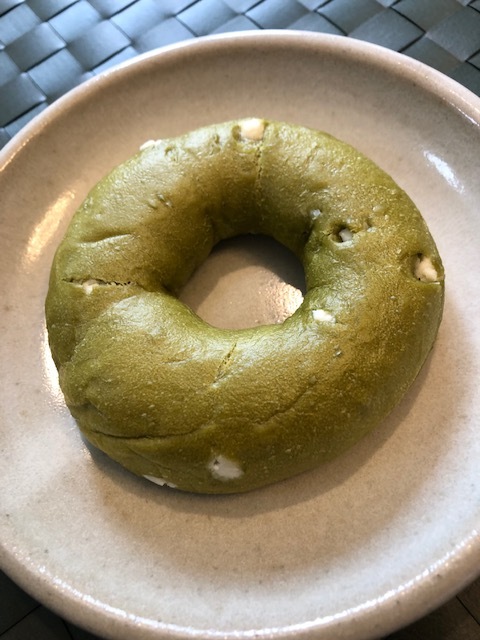 Yesterday our daughter-in-law brought me a matcha bagel with white chocolate chips. I was a little wary about how it might taste, but the chips offered a tiny bit of sweetness, and otherwise it was a nice chewy, yeasty bagel with a slight matcha flavor – delicious! Besides enjoying foods with little to no sugar, things here also seem to have a lot less fat – our palates are going to have to readjust when we get back to the U.S.
Spring has arrived – flowers are blooming everywhere and the cherry blossoms have come and gone – so when it was 70+ degrees yesterday we figured it was time to ditch the jackets and break out the spring clothing. I went without a jacket, Brett put on shorts . . . and boy did we get some looks! Most people seem to still be wearing darker colors I associate with fall and winter along with sweaters, jackets or a coat. I remember once I wore a sleeveless dress here on an especially hot day during Indian summer, and got many stares because I was apparently not dressed appropriately for the fall season. Maybe there is a dress code in Japan, and certain dates when can safely switch one’s clothing from one season to the next, but I have no idea if that’s true or when that is. Above is a page of calligraphy Brett produced last week in his class. 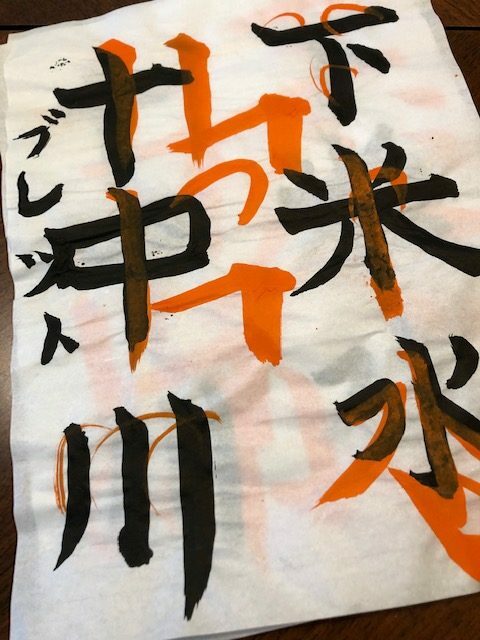 Lots of orange corrections from the sensei, but see the small circle-like strokes in a couple of places? Those indicate his brushwork is correct! He studies every day, practicing his kanji and learning both characters and the kana, although the brush he bought last week is too large and causing him problems. One of the things I love about Japan is that while his teacher is considered a master calligrapher, she still studies under her master! The pursuit of perfection is a lifetime goal here, no matter what form of art you pursue. I’d like to say I’m sitting in this chair as I type, but actually I’ve slid down to where I’m practically lying flat! We don’t have a sofa in our apartment, just two big leather armchairs (and one ottoman). 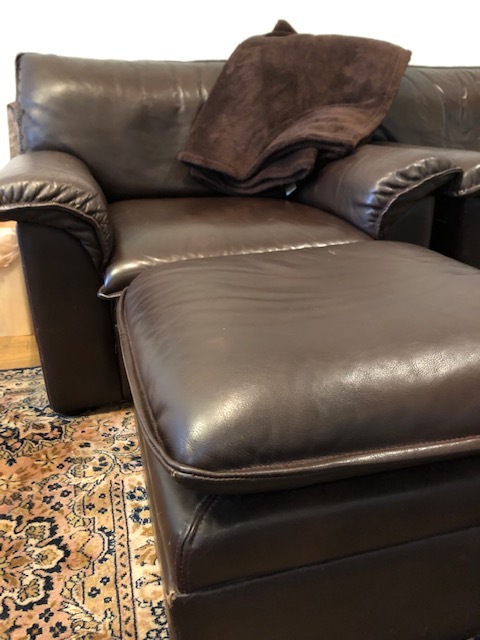 They are mostly comfortable, but the leather is slippery so as I read or write in my chair I slowly slip down, ending up almost on my back after a while. Also, I had to put tape on the bottom of the ottoman because it was slipping across the rug and I was ending up in the space between it and the chair (which was annoying but also funny). Lower furniture is just one of those things we have to deal with in Japan, with the chairs nearer to the ground than we are used to, and it can require extra effort (especially in the knees) to get up. Brett usually sits at the dining room table to read and work, but those chairs are low as well. We like our apartment but I have to admit we’re looking forward to having a good old American sofa to stretch out on again. Three of our CookDo favorites here: sweet & sour pork, chili shrimp, and stir-fried pork & peppers. The instructions are in pictures on the back so they’re very easy to follow and prepare. It’s been difficult at times coming up with ideas for meals when all we have is a cooktop, a small microwave, a rice cooker, and a small kitchen. We eat American foods occasionally when we can find stuff we like at the commissary (things like bacon or sausage, or Stouffer’s macaroni and cheese or stuffed green peppers), but I mostly use things we find in the supermarkets here. I miss being able to make casseroles or put something into the slow cooker. My favorite product here is CookDo, sauces for making easy and delicious Chinese dishes. 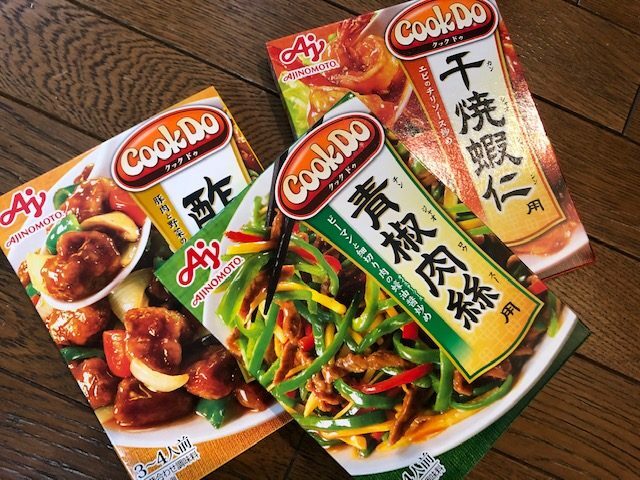 I used CookDo back in Hawai’i to make mabo nasu (ground pork with eggplant) and mabo dofu (ground pork with tofu), but we only could afford them when we could find them on sale, and even then it was $3 – $4/package, a real splurge. In Hawai’i a store might have three or four different sauces, but here there are over 30 varieties (!!!) available, and a package costs around $1. The bottom of both of our suitcases will be filled with packages of CookDo when we return to the U.S. There will be giveaways after we return to the U.S. – three of them! I have been having a great time putting things together and hope you’ll be motivated to enter. Stay tuned! Finally, I am currently unable to comment on Blogger. I have made comments using the Name/URL selection on several blogs, but when I hit submit the comment vanishes. I don’t know if it’s a WordPress thing, a Blogger thing, a Japan thing, or a combination of all three. I am sitting here trying to imagine the taste of that bagel – and failing I suspect. I find it so interesting how the same basic food is transformed to fit local tastes or simply as an experiment. The matcha taste wasn’t very strong, and there weren’t a lot of chips, so mostly it tasted like a regular bagel. I don’t think I’d rush out for another, but it was good and I’m glad I got to try it. Japanese bakeries produce some amazing stuff – baking is an art form here! That calligraphy lesson is so interesting. Kudos to Brett for taking that on. It looks difficult. I think you’ll enjoy being near a Sprouts market when you return to California. Good, very large produce dept, and amazingly low prices. You’ll have no problem eating well, including lots of fresh produce, should that be a priority. There are two weekly farmers markets in San Clemente alone. We gave up on bread about a year ago. Agreed, too sweet. Even our salsa has too much sugar for me. I get my fix through real maple syrup. OK- that is REALLY sweet, but I don’t need much of it. Thank goodness we live in a place we can get fruits and veggies year round. I have learned how to store things so we can eat local most of the year. You won’t have that problem since the growing season in CA is almost year round. The fish! Good rice! Small dishes! You have made a good choice to land in your old home town. Make sure to get, at least one, great picture of the grands. We do mini canvas prints from CVS for $7.00. Grand pictures are priceless when you are missing them! Amazing how sugar is in EVERYTHING in the US. I have really enjoyed your posts from Japan. Would love to go there someday and you’ve given me courage to do it!